Say /testlight and it will present all possible solid/transparent combinations (of size 2³), with one transparent node being full-sized nodebox and others being air. UPD: found a case where a bug remains. Fixed. 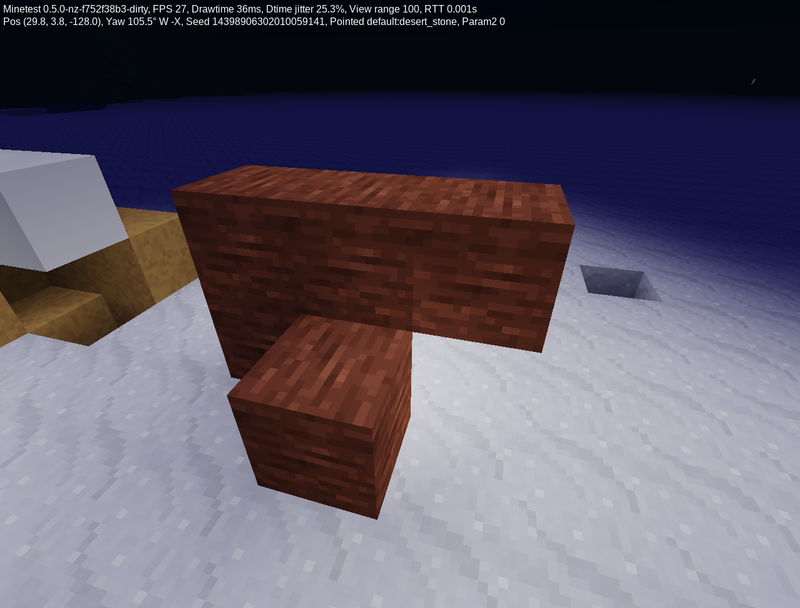 UPD: that affects non-solid nodes per se as well (don’t say my torches are broken, I know that myself): Fixed. @numberZero Why do you do this in the same manner for solid nodes as for non-solid nodes (without face-dependence)? Thanks for the test cases! @DTA7 There is face dependence. My code assumes light at a corner of a face of a solid node is the same as light at the corresponding corner of the (always non-solid) node in front of that particular face. That should always be the case. By the way, I feel I fixed the bug. 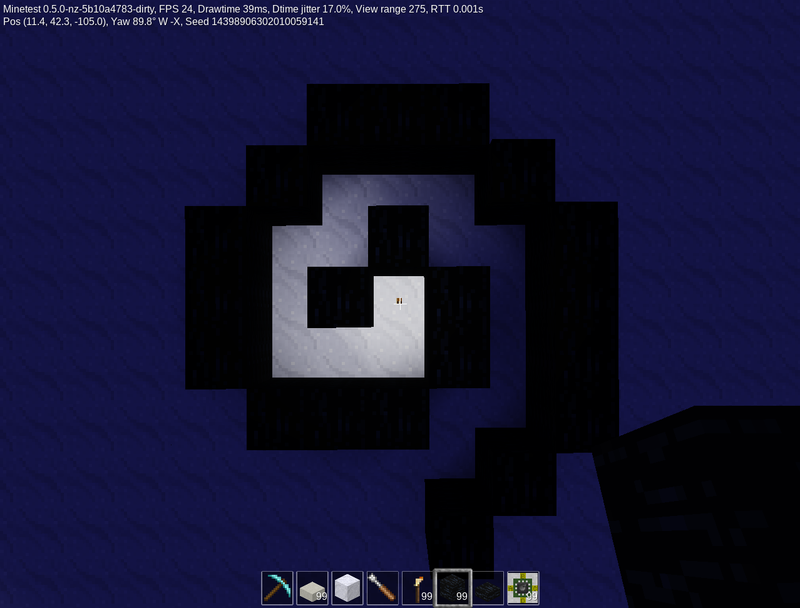 The light spot is there because one node propagates light, and there is a torch inside. @numberZero Oooh, that's a good idea! I closed my pull request. This however still remains (I think only for the solid node), do you see what I mean? 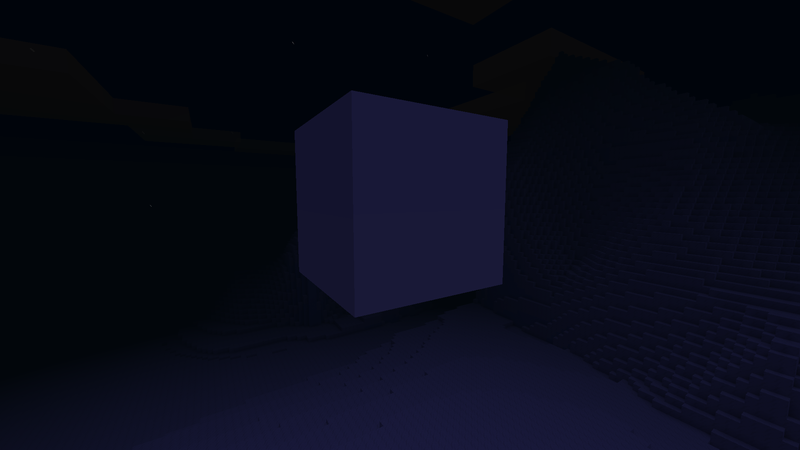 Somehow, the daylight lighting values are a little different, but they were not before this pull request (and mine), which seems to be only visible at night. Both 02bc55c and 707dda6 do the same, so both should fix these bugs. They differ in style only. @DTA7 Of course they are different. There is less sunlight below the box. Your old code have not considered that value at all IIRC, but that’s a straight way to various problems. To clarify: my PR lets light wrap around nodes. 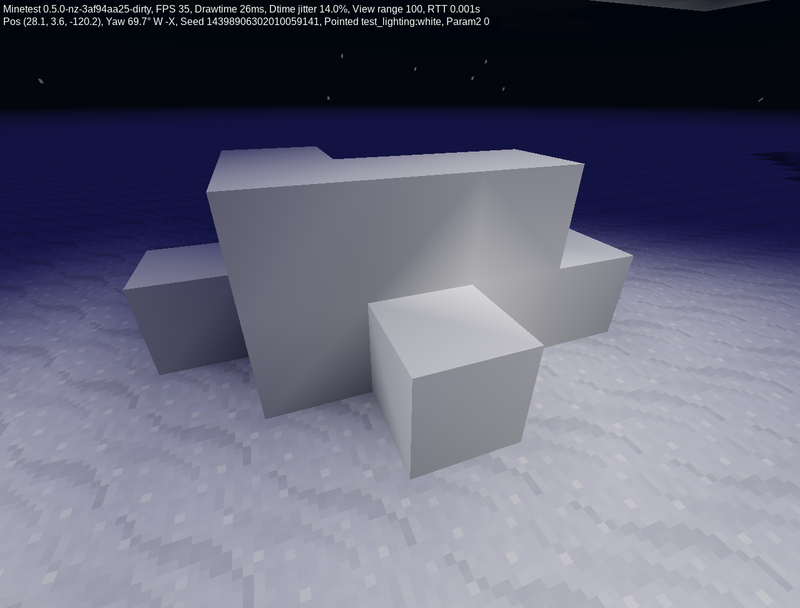 While that may sound weird, that’s actually the way light behaves in MT. @numberZero OK, the higher value is indeed above, I was confused because the "boundary" in the interpolation was not always on the same height. Er, this is not WIP anymore; forgot to change the title, sorry. Since i don't understand the code changes the 2nd approval should be from a dev who does. I can't claim to understand what's going on here, but looks good generally. @lhofhansl That would need full rewrite of the lighting system. That’s not feasible, at least currently. is this not better to use a bitset here ? Seems optimum then, ok for me. k + 4 ? can we have a constant ? But k + 4 isn't consant? this number is a part of the algorithm, not some random constant. Yes this is fine as it is. We tend to prefer the smallest integer type instead of an 'int'. That’s a local variable, so it will probably use the whole 8-byte (4-byte on a 32-bit system) register anyway. But would it be u8, the compiler would have to make sure it uses lower 8 bits only, because unsigned overflows must work that way (that shouldn‘t cause any runtime overhead here, but only because the bounds are compile-time constants). OTOH, signed overflows are undefined behavior, so the compiler never needs to care of that. Looks good so far but it's not entirely fixed. 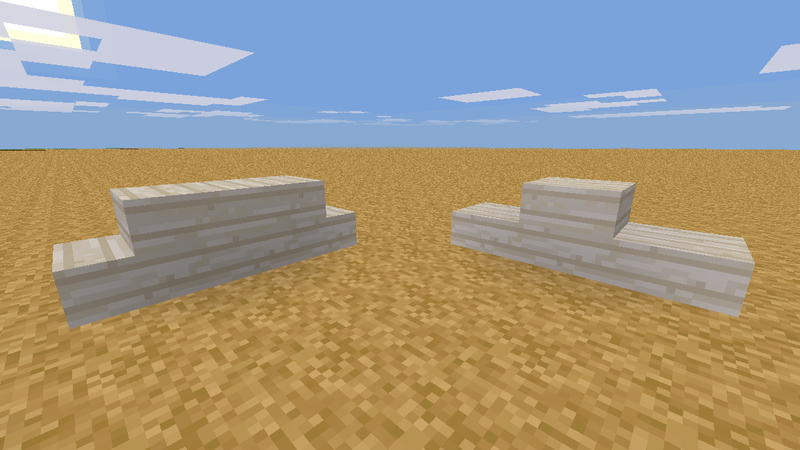 Here a cobblestone node before placing (top) and after removing it again (bottom). 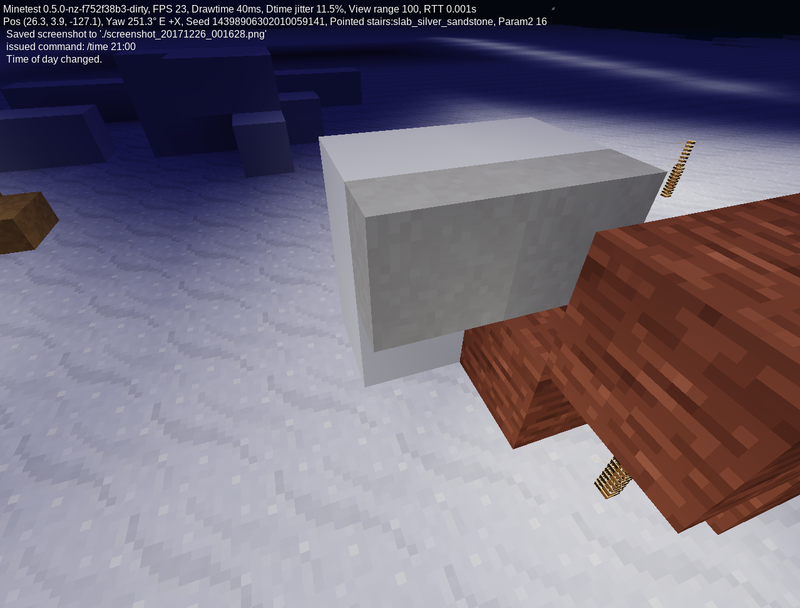 This only happens on a mapblock border. 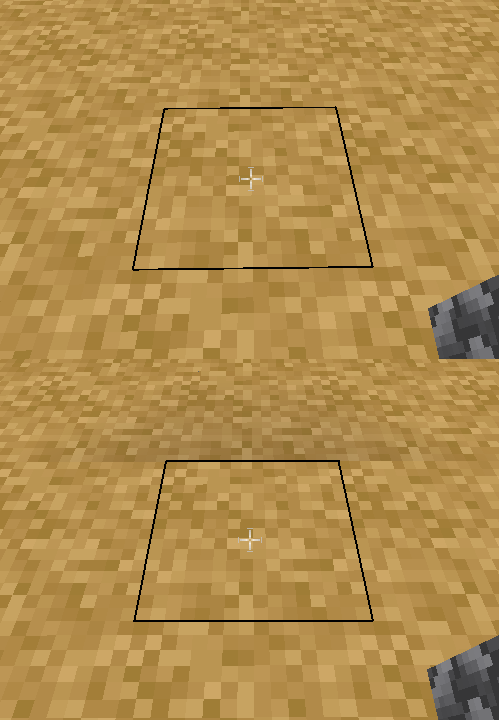 @SmallJoker I suppose the surface on your screenshot is on the mapblock boundary. If so, see #6765 for details. @numberZero Never mind. I thought this PR would also fix that light issue, using a different approach..
"I updated #6838, it should fix dark lines now, but some glitches will remain; this one now optionally fixes the glitches at the cost of more CPU load." So this PR now fixes the extreme lines, and leaves very subtle glitches that are optionally fixed by #6765 at the expense of more neighbour blocks being updated. Read the #6765 thread for explanation.